Elevator B is an urban habitat for a colony of honeybees, which originally occupied a boarded window in an abandoned office building in Buffalo, NY. Although not created for a specific client organization per se, the project has generated a great deal of public curiosity because of the combination of the colony of honeybees, an interesting and until very recently, a restricted-access site, and a well-designed object. The site, Silo City, is a group of largely abandoned grain elevators and silos on the Buffalo River. Elevator B is intended to be a symbol of the site’s environmental and economic regeneration. The 22-foot tall tower is a honeycombed steel structure designed and built utilizing standard steel angle and tube sections. 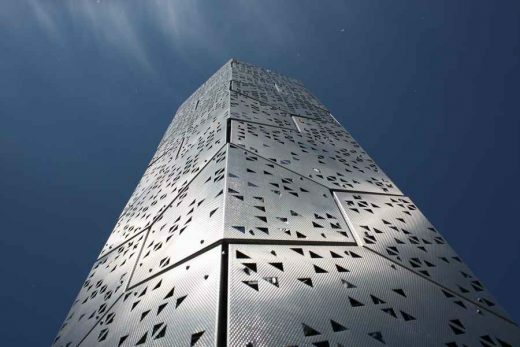 It is sheathed in perforated stainless steel panels that were parametrically designed to protect the hive and it’s visitors from the wind, and allow for both solar gain in the winter and shading in the summer. The bees are housed in a hexagonal cypress box with a laminated glass bottom through which the bees can be observed. This “beecab” provides protection, warmth and separates entry access between bees and humans. Visitors are able to enter the tower, stand below the cypress beecab and look up to view the colony of bees behind glass, similar to an ant farm, as they build their hive. Beekeepers gain access to the hive by lowering it, allowing them to ensure the health and safety of the bees. This feature also caters to the school groups that visit the site, encouraging children to get a close up view. Visitors to the site have ranged from school groups discussing the natural ecosystems of Western New York and the Great Lakes, to adult photography classes using Elevator B and the site as a subject. A nearby nature preserve has also led several field trips to the project and is in the process of developing a formal education program centered on the bees and on colony collapse disorder, which threatens the species. Interpretive signage about honeybees and the site is currently under development and will be part of the larger redevelopment plan for Silo City. The questions asked by visitors range from the simple to the complex, but they would never have been asked in the first place if the visitor did not have the access to bees that is fostered by Elevator B. This is a clear demonstration that architecture can and does do more than serve aesthetic or structural purposes. In Elevator B’s example, it sparks children to learn and adults to reconsider what they thought they knew. This includes the designers themselves, who have not only designed for the needs of their clients but have become inspired to become advocates for them as well. Elevator B is the 2013 Architizer Design Award Winner in the Student Design/Build category and the 2012 WNY AIA Pro Bono Publico Recipient. It has also been presented at several symposiums, including the Buffalo Architecture Foundation’s Fall 6Mbs and the University at Buffalo’s “Beyond Patronage”. In 2014, it will be featured in the Metropolis publication Post-Sustainable: New Directions in Ecological Design. A group of 3 faculty members (from the University at Buffalo School of Architecture and Planning Ecological Practices Research Group) coordinated a student competition to design and build an installation for a bee colony. Elevator B is a collaborative project between graduate students from the University at Buffalo’s School of Architecture and Planning and Rigidized Metals, a Buffalo based building material manufacturer. The overall goal of the project was to successfully design for the relocation and habitation of a colony of honeybees occupying a building at Silo City, a dense cluster of grain elevators in Buffalo, NY. Elevator B was selected from a group of ten entries by a mixed panel of jurors, who represented Rigidized Metals, the fields of architecture and planning, and the bees. Elevator B is an iconic gesture of the regeneration of Silo City, both naturally and economically. The material properties of the tower represent the cluster of material manufactures now located around the site while housing the colony of bees. Visitors enter the tower from below and look up, similar to the way one experiences the silos and bins of the nearby Marine A elevator. The 22’ tall honeycombed steel structure was designed and built utilizing standard steel angle and tube sections. The structure is sheathed in perforated stainless steel panels that were designed to protect the hive and visitors from the wind, and allow for solar gain and shading. The bees are housed in a hexagonal cypress box with a laminated glass bottom through which the bees can be observed. This provides protection, warmth and separates entry access between bees and humans. Professional beekeepers gain access to the hive by lowering it, which allows them to ensure the health and safety of the bees. This feature also caters to school groups that will visit the site allowing children to get a close up view. The tower’s orientation also frames key views of the surrounding historic grain elevators and the new upcoming developments of Silo City. The construction phase started May 14th at the University at Buffalo Material and Methods Shop. The exterior metal panels were developed by the team in coordination with and fabricated by the project sponsor, Rigidized Metals. The entire project was fabricated and installed by the team of students and was completed in the beginning of June. The bees were relocated into the tower on June 8th and have been rapidly building honeycomb inside their new home.